Cleo is the family name of light sources manufactured by Philips for ultra-violet sun tanning applications, and the HPA group is a series of iron-cobalt metal halide lamps within this category. H indicates that the filling is mercury, chemical symbol Hg. P implies that the discharge tube is a high pressure type. 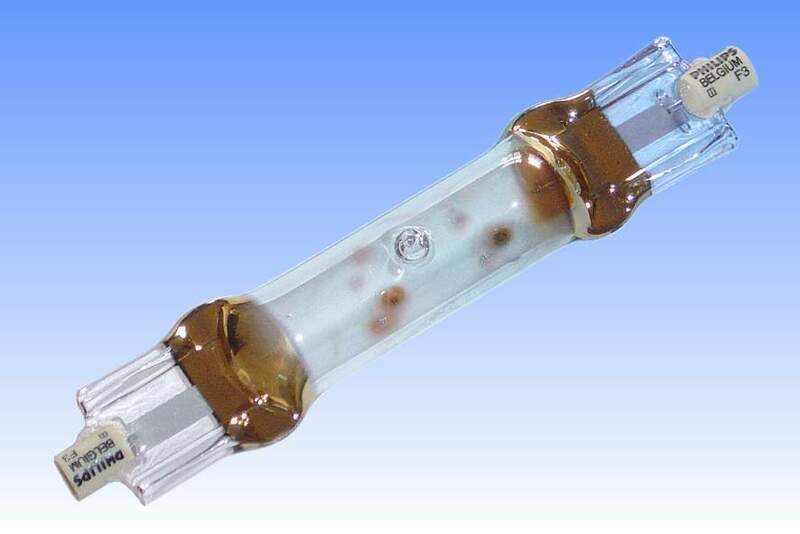 A signifies the absence of an outer bulb around the discharge tube, or that any outer bulb is clear with no phosphor coating such that some UV is transmitted. A similar HPM family exists, dosed with alternative halides to shift the UV emission to another part of the spectrum. The pressure is controlled in this lamp such that its output spectrum is a rich source of longwave UV-A radiation, which will quickly provide the desired suntanning effect without producing excessive quantities of the more dangerous UV-B and UV-C radiations. Since this arc tube burns in free air two changes are made from the design of the normal 400W metal halide arc tubes. Firstly, the length of end pinch-seals is increased slightly. This affords a greater degree of cooling and minimises risk of lamp failure arising from oxidation of the molybdenum foil seals. Yttrium-doped molybdenum further reduces the effects of corrosion emanating from inside the lamp. Secondly, the area behind the electrodes is coated with a layer of pure gold. This acts as an excellent infrared reflector and helps to prevent heat losses out of the end of the arc tube. The effect is both to accelerate the run-up time and to ensure that the cold spot temperature of the arc tube is sufficiently high to vaporise the mercury and generate a high enough vapour pressure above the halide salts. References: 1) Philips Germany Lamp Catalogue 2003.